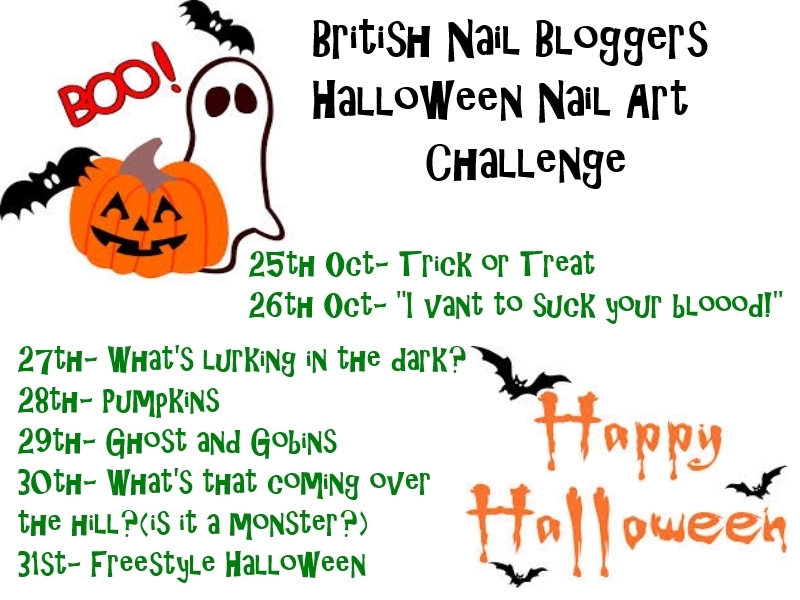 Today in the British Nail Bloggers Halloween Nail Art Challenge it is time to do Pumpkin Nail Art. By coincidence my little brother and myself actually carved our own pumpkins today, so I am pretty much pumpkin'd out! Today's nail art uses all Barry M products, Gelly Satsuma, the perfect bright Pumpkin Orange. Barry M black crackle which I left un-topcoated for a matte effect and their black Nail Art Pen for the accent nail. I've said it before and i'll say it again, I still love crackle polishes. The matte black makes this manicure look really mean and goes fabulously with the super bright orange! Here is a little graphic with all the challenges the British Nail Bloggers are doing! Have you carved your pumpkin yet? This is s a great Halloween look! Super cute...love the use of crack!